Audio-frequency transformers are used mainly for matching impedances and transmitting audio frequencies. They also provide isolation from direct currents and present balanced impedances to lines or circuits. The magnetic core for this type of transformer is usually an EI or EE type using either audio-grade silicon steel or nickel-alloy tape cores in toroidal form are used for extreme bandwidths. High permeability ferrite cores with highly polished mating surfaces are also used to obtain wide bandwidths. Important parameters - Important parameters are generator and load impedances, Rs and Rl, respectively; generator voltage ; frequency band to be transmitted; harmonic distortion; and operating voltages (for adequate insulation). Low Frequencies - At low frequencies, the equivalent unity-ratio network of a transformer becomes approximately as shown in Fig. 1. 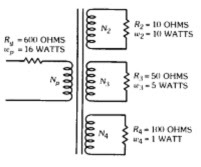 In a good output transformer, Rp , Rs and Rc may be neglected. In input or interstage transformers, Rc may be omitted. 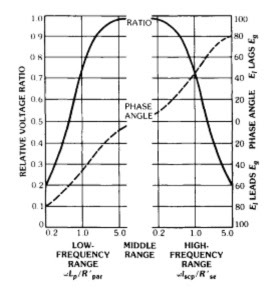 High Frequencies - At high frequencies, neglecting the effect of winding and other capacitances, the equivalent unity-ratio network becomes approximately as in Fig. 2.
l scp = inductance measured across primary with secondary short-circuited = l p + a2l s.
The low- and high-frequency responses are shown by the curves of Fig. 3. Fig. 3 Universal frequency and phase response characteristics of output transformers. If at high frequencies the effect of winding and other capacitances is appreciable, the equivalent network on a 1:1 turns-ratio basis becomes as shown in Fig. 4. 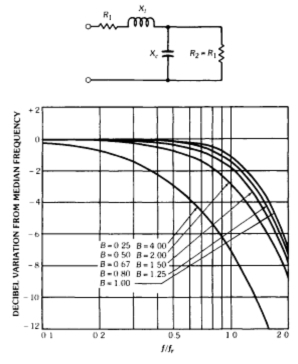 This high-frequency response is plotted in Fig. 5 for R2 = R1 (matched impedances), based on simplified equivalent networks as indicated. At frequency fr Xl = Xc and B = Xc/Rl. where 100Ih/If = percent of harmonic current measured with a zero-impedance source (values in table 1 are for a 4-percent silicon-steel core). Zsc = transformer primary impedance with secondary winding short-circuited. If more than one secondary is used, the turns ratio to match impedances properly depends on the power delivered from each winding.